Caribbean Bay is probably one of the biggest water parks in the world, covering an area of 46 square miles (according to the wikipedia). It is also part of Everland, the biggest attraction park in South Korea, although you have to buy both entrance tickets separately. 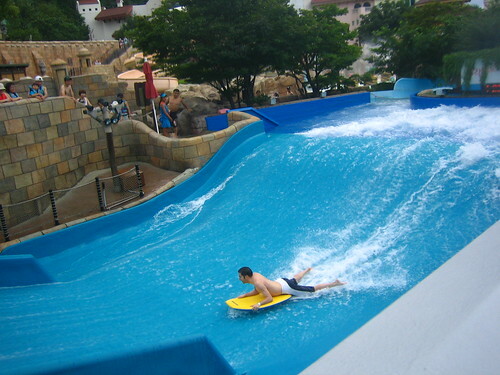 Caribbean Bay is located in Gyeonggi-do province, at around one hour and a half drive from Seoul. Given that I got tickets for the park for a reasonable price, 10,000 KRW (around $8) instead of the 55,000 KRW ($44) that you have to pay to enter this park during peak season, we took this chance and spent the day there, despite the weather not being so nice. 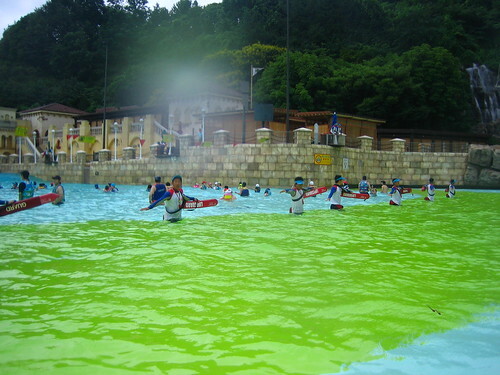 The funniest thing for a foreigner that goes to a Korean water park (or beach, swimming pool, etc.) is probably the way Koreans (specially girls) dress for this kind of occasion. Interestingly enough, you can’t see a single bikini. Well, actually they do wear them, but they are hidden underneath those long sleeve t-shirts (to protect from the sunlight, as tanned bodies are not fashionable at all here) and mini-skirts or short pants, of course everything fitting together perfectly. It is also important to make use of a cup and/or sunglasses to protect you face from the evil and cancerogenic sun. Another important detail are your toe nails. Yes girls, your toe nails have to be perfectly pedicured, and if possible, also matching your bikini. These bay-watches are there just to watch that nobody stands on the area where waves break, and that nobody without a life-jacket goes into the deep area of the swimming pool. The life-jacket thing makes sense specially if you consider that this pool can get really, really crowded, and also that most Korean can’t swim. And here I am like a king-of-waves in front of the Korean people. The water you see doesn’t go downwards, but upwards, allowing you to stay (not without much suffering and equilibrium) in a quite static position on the bodyboard. Wow! So stylish! 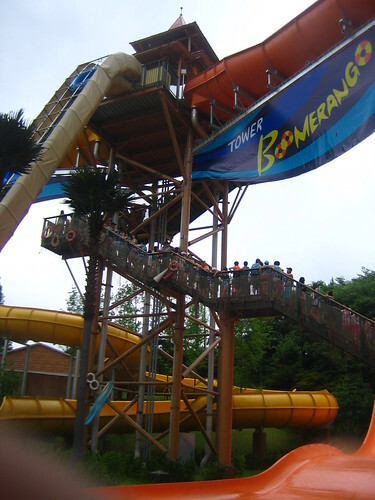 So cool!… So ashamed when I fell of after half a second in that position! Even on a rainy day, early in the morning, you have to wait quite long lines to get to the attractions. This is what we had to wait before enjoying the boomerango. 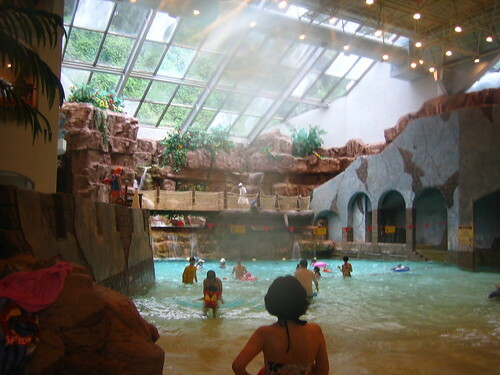 Besides the outdoor area, there is also a quite large indoor area. Its perfect for babies and the rainy days of Korean summer. 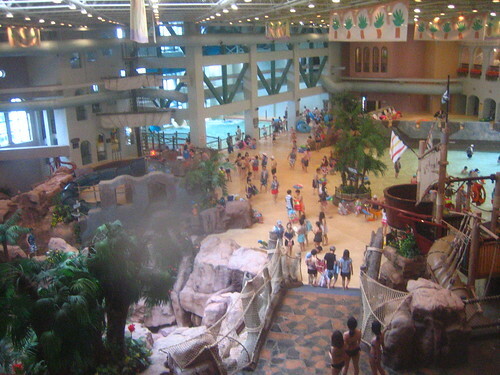 And another view of the indoor area. I saw you get a very cheap ticket for Carribean Bay. How do you get it? I will go to Seoul tmrw. Is it possible to reply it today?